Turkish students both plead 'not guilty', trade blame over Nazi salute to Israeli students at site of former concentration camp. 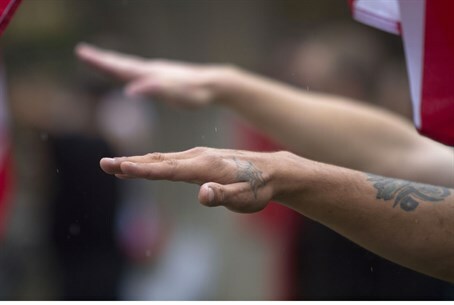 Two Turkish students arrested at the site of the former Majdanek concentration camp for performing Nazi salutes in front of a group of Israeli students and shouting "Heil Hitler" have been acquitted by a Polish court in Lublin. The pair, identified only as Mehmet A. and Mesut T., were arrested for "promoting fascist propaganda" after members of the Israeli group filed charges. If found guilty, they could have faced up to three years imprisonment in Poland. According to JTA, both defendants pleaded not guilty and accused the other of committing the offense. Their lawyer had argued the case should be dismissed as neither had caused any significant social harm. The prosecution could still appeal the ruling. At the time the Turkish students - who formerly studied in Technical University of Lublin said they had not meant to cause any offense. "All we wanted was to take a couple of pictures [posing making the salute] as memories from the camp. We did not know it was a crime in Poland," claimed Mehmet A. Just two months later another two Turkish nationals were arrested for a similar offense, this time at the entrance of the site of the Auschwitz extermination camp, after performing Nazi salutes beneath the infamous sign "Arbeit macht frei" ("Work makes you free") sign, which stands at the entrance to the former death camp.